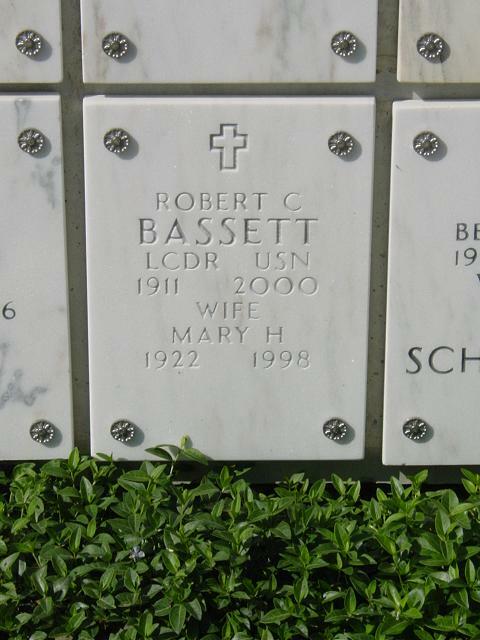 Lawyer and publisher Robert C. Bassett died of Alzheimer's disease May 2, 2000, in Las Vegas. He was 89. Bassett, who was born in Sturgeon Bay on March 2, 1911, and graduated from the University of Wisconsin in Madison, practiced law with Minahan and Bassett in Green Bay from 1935 until entering the U.S. Navy in 1942. He was publisher of the Milwaukee Sentinel from 1954-'56 and was a vice president of Jos. Schlitz Brewing Co. before moving to Chicago, where he established his own publishing firm. Bassett Publishing Co. printed Chicagoland, a monthly events-listing magazine, and programs for the Chicago Bulls, the Chicago Symphony and Big 10 football teams. Bassett was a labor negotiator, and two U.S. presidents - Democrat Harry Truman and Republican Richard Nixon - appointed him to national boards. He was the son of Clark and Lillian Bassett. His father founded a drugstore in Green Bay six months after Robert was born. The younger Bassett was a member of a UW Big Ten championship track team and the university's national championship debating team. He was junior class president and on the editorial board of the Daily Cardinal, the campus newspaper. He received his law degree from Harvard University in 1935. He spent part of World War II in Washington, D.C., where he was head of the Navy labor relations division. After the war, he became labor counsel for the Hearst newspaper organization, which then owned the Sentinel, and he became publisher of the Milwaukee daily paper eight years later. In 1956 Schlitz hired him as vice president in charge of labor relations and community activities. Five years later, he left for a publishing job in Chicago and founded his own firm there in 1965. A daughter said he closed the company 10 to 15 years ago. In 1952 Truman named him to the National Wage Stabilization Board, and in 1971 Nixon appointed him to the national Pay Board. In 1953 he was the U.S. employer delegate to the International Labor Conference in Geneva, Switzerland. Bassett was on the UW Board of Regents from 1958 until he moved to Chicago. He also was a past director of the U.S. Chamber of Commerce and on the board of the National Small Business Association. His wife, Mary, died in 1998. He is survived by three daughters, Jane Quinn of Orlando, Florida; Pamela Welter of Las Vegas; and Karen Freeman of Westport, Connecticut. Burial will be at Arlington National Cemetery in June. Sentinel who lived for many years in Chicago. He died Tuesday in Las Vegas, Nevada, at age 89. Born in Sturgeon Bay, Wisconsin, in 1911, Mr. Bassett graduated from the University of Wisconsin in 1932 and earned a J.D. from Harvard University in 1935. He was admitted to the Wisconsin Bar in 1935 and the Supreme Court Bar in 1942, and was a partner in the firm of Minahan and Bassett in Green Bay, Wisconsin, from 1935 to 1946. Mr. Bassett served in the Navy during World War II as a Lieutenant Commander, working with the Shipbuilding Commission and the National War Labor Board stationed in Washington, D.C. In 1946, he became labor counsel for the Hearst Corporation. From 1954 to 1956, he served as publisher of the Milwaukee Sentinel. Except for two years as vice president of the Joseph Schlitz Brewing Co. in Milwaukee, Wisconsin, Mr. Bassett continued in the field of publishing for the remainder of his career. He was the founder in 1965 of Bassett Publishing Co. in Chicago, which produced publications, such as Chicagoland magazine and programs for the Chicago Bulls, the Chicago Symphony and the Big 10. He served as a member of the Board of Regents of the University of Wisconsin from 1958 to 1961. Additionally, from 1971 to 1973, Mr. Bassett served on President Richard Nixon's Pay Board as a representative of small business. He also served on the board of directors of the National Small Business Association from 1968 to 1973. Mr. Bassett's wife, Mary Holmes Bassett, died earlier. He is survived by his daughters, Jane Quinn of Orlando, Fla., Pamela Walter of Las Vegas and Karen Freeman of Westport, Conn.; seven grandchildren, and eight great-grandchildren. Burial will be at Arlington National Cemetery in Washington, D.C.